Ultra-fine and silky in a ‘pin-dot’ fabric – think airtex and you won’t be far off – but much lighter and smoother, Elle Pin Dot Shoe Liner Socks are highly breathable and very low profile, sitting flat against the foot, with reinforced, laser-cut edges for a near-invisible look and feel. With an 85% cotton rich construction, and a smooth, soft footbed, these liners will keep you cool and comfortable. 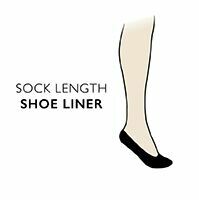 Silicone ‘non-slip’ grips at the back of the inner heels stop any chance of these Elle Pin Dot Shoe Liner Socks working their way underfoot through the day.